Saturday, January 23, 2010 AGUAS CALIENTES, PERU. It was raining now and down in the deep canyon where Aguas Calientes is squeezed between soaring walls of rock the Urubamba River reverberated with a loud, deep, continuous roar. Boulders the size of houses were being pushed around in the waterway like toys. The dark brown turbulent water exploded into the air like lava as waves crashed through the narrow channel next to the small parkway along the street, many splashing higher than the retaining wall that looked weak and insignificant in the face of the onslaught. It was mesmerizing to watch, dangerous and seductive, roaring its warning in deep sonorous phrases that sent chills down our spines. 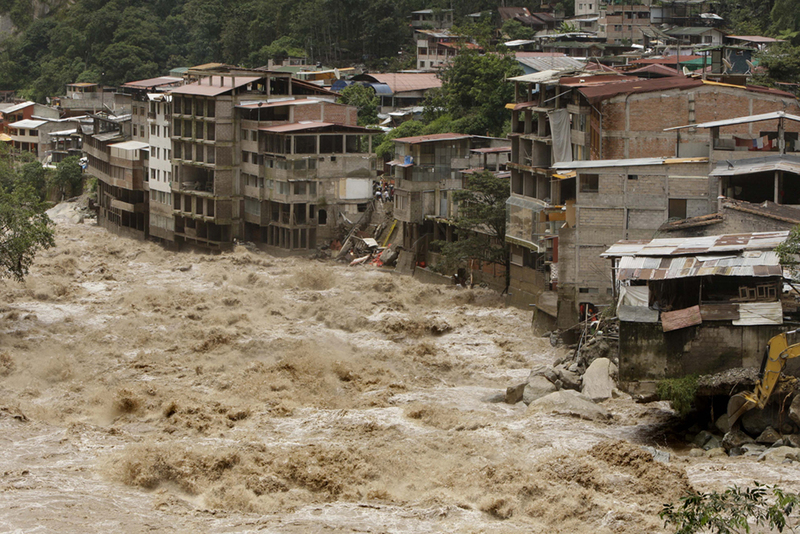 The serious situation on the Urubamba River sinks in as Chris stands next to the small retaining wall along the main road, with Jim in the background filming video of the torrent. Earlier in the day, we had met our guide Julian Perez from Llama Path for one final meal and goodbye, at a restaurant named “Hot Springs” (Aguas Calientes) after the town, right off the main road along the river and next to a set of unused rail tracks. 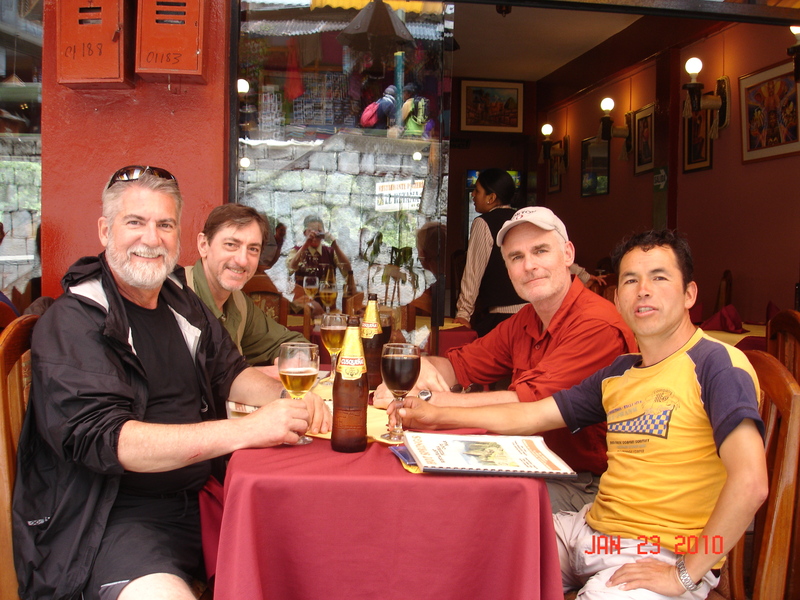 There, he gave us our Hiram Bingham Train tickets and in the sunny warm atmosphere exchanged light jokes about some of our memories of the Inca Trail Trek to Machu Picchu. Little did we know what was to come. The sunny morning spent in Machu Picchu, far above us now on the saddle between Machu Picchu Mountain and Huanya Picchu Peak, was a memory. The pleasant hour or so at the public Hot Baths in the canyon uphill from the main square of Aguas Calientes, where we relaxed languid in the various natural hot spring pools to sooth our tired muscles from the trek as a misty rain began to fall, now seemed a fantasy as the reality of the grave situation developing at the PeruRail railhead station in Aguas Calientes (the only way in or out of a town the government likes to call “Machu Picchu Pueblo”) started to sink in. Our tickets for the plush Hiram Bingham train back to Cuzco said we were to leave around 5:50pm, so we arrived forty minutes early to be checked in and processed. 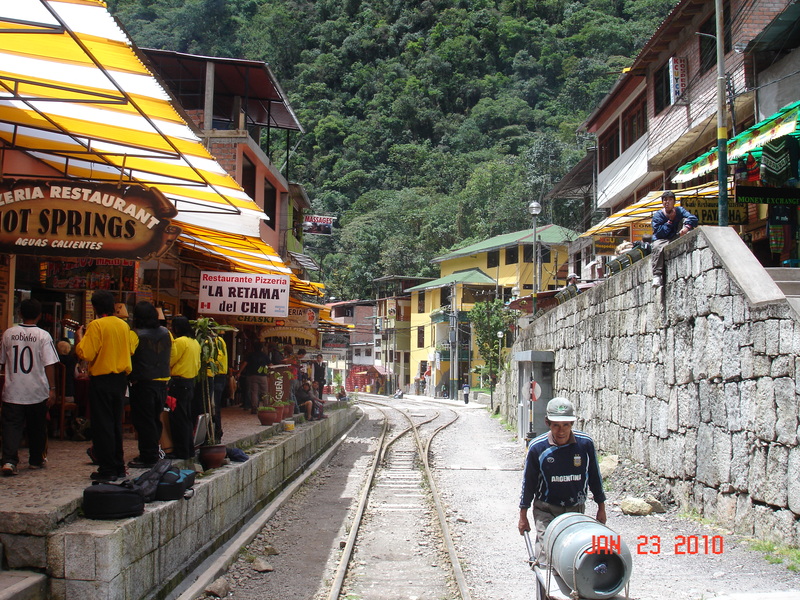 Problem was, there were no trains in the station which handles eight or ten trains to and from Machu Picchu Pueblo each day. The Departure Board showed only two departures, neither of them were our train, and one of the departure times was already long past. Soon, those video monitors went blank…another bad sign. 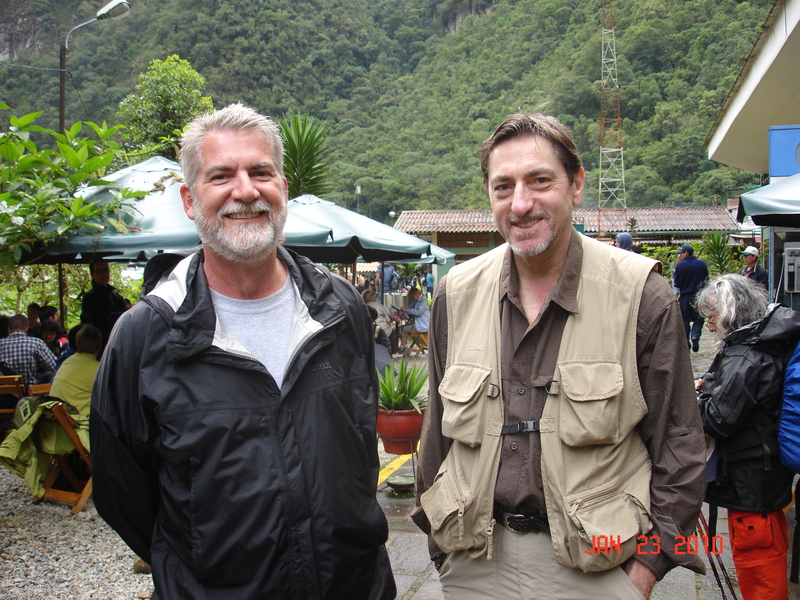 Dave and Jim at the Aguas Calientes PeruRail Train Station, keeping a good attitude in spite of uncertainty! Within a short time, every square foot of floor space and every available table and chair inside and outside the train station (at least where it was dry) was covered by travelers and their baggage. A light rain continued to fall, reminding us we were in the rainy season in Peru! To get to the Servicios Sanitarios one had to pick through and step gingerly over hundreds of bodies anxiously waiting for some bit of news about their train out of that town. 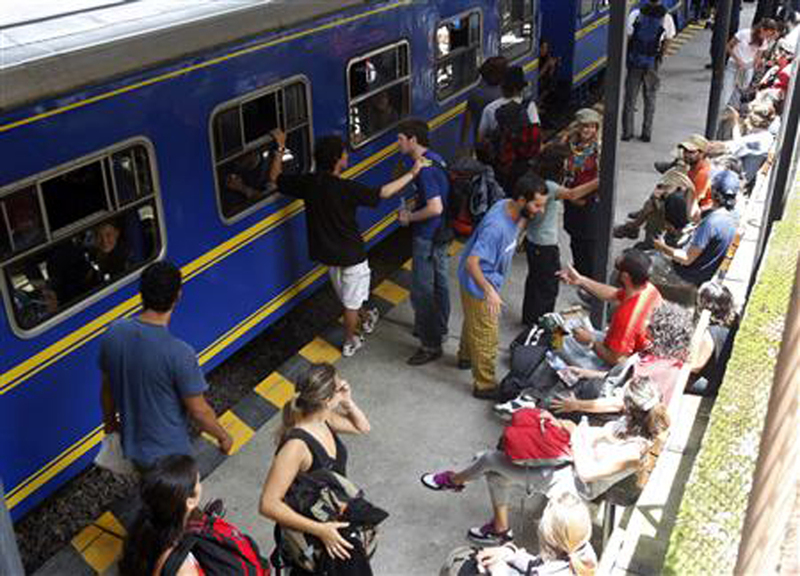 Frantic and frustrated tourists try to board the earlier train…to no avail! Rumors began their insidious spread among the passenger want-to-be’s, everything from landslides to flooded tracks to trains stuck between the proverbial rock and a hard place. We had snatched a nice umbrella table and three chairs outside the main building early on, so we were fortunate to have a place to sit and some fresh air and protection from the rain…while still being able to observe the slow tide of tension build among the hundreds of people from all over the world now facing the reality of being stranded in this remote Urubamba River town in the high jungle of Peru. Chris, always the clear-thinking practical member of the team, suggested one of us head out into the night streets of Aguas Calientes to find a hotel room for the night…just in case we might need it in the event some of the rumors turned out to be true, and before the remaining hotel rooms were snatched up by the other stranded visitors. I was appointed for this reconnaissance mission due to my comfort with the language. So, off I headed into the night, drizzle still falling from the dark brooding sky and the roar of the Urubamba echoing from the huge canyon walls all around me. There are a few hotels perched right on the river in Aguas Calientes, some very close to the train station and others down the road ,which eventually takes you over a bridge and up a steep winding switch-back road to the Machu Picchu ruins. The convenience and proximity of those river-front hotels to the station led me there first, rather than try to explore the dark streets of the town back uphill and away from the river and train station. 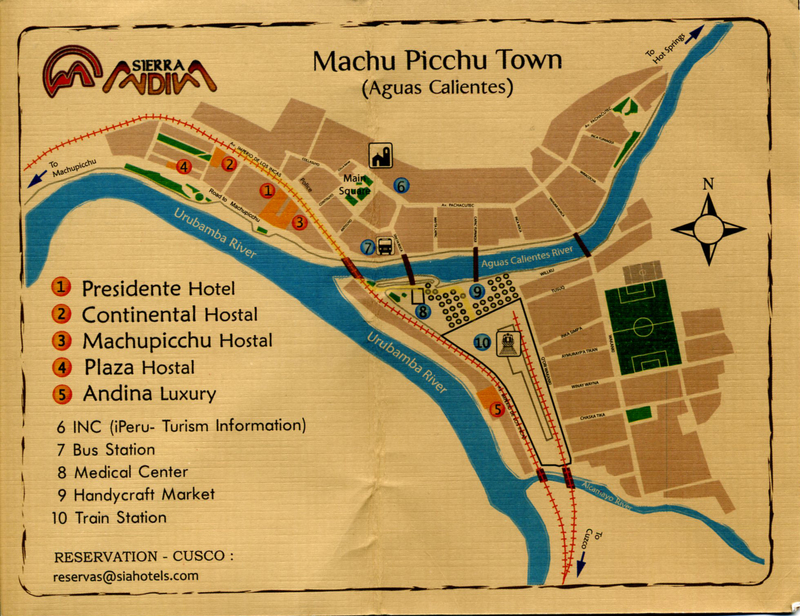 The first hotel I visited (Andina Luxury Hotel) had just been finished and had no guests, but all the utilities were turned on and they were eager to rent out rooms, however their rates seemed high and I went next door to get a price check. Looking through the lobby as I walked in the front door of the Hanaqpacha Inn, the view out the picture windows of the dark brown waves of the raging Urubamba splashing up above the main floor level, reminded me of the eminent danger the whole village was facing! As I was talking to the clerk at the front desk, a Manager for the four hotels in Aguas Calientes owned by this group came rushing in from the street and, in Spanish, told the clerk she could not rent any more rooms at this hotel…the authorities had just notified them that there was a strong possibility they would have to order an evacuation of all the properties abutting the river! 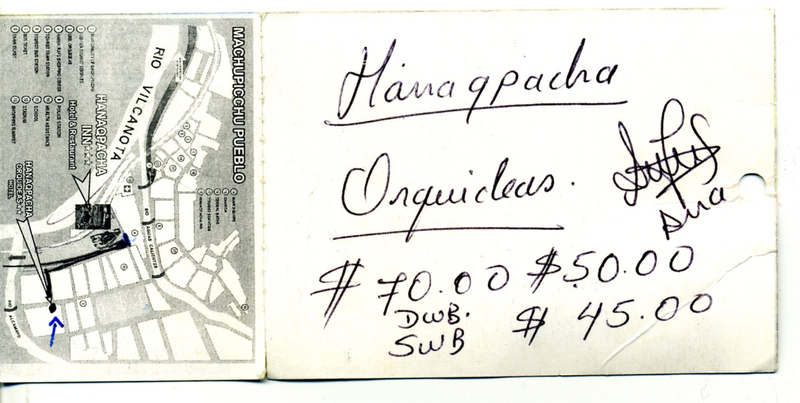 This Manager recommended a hotel of theirs uphill from the river, the Hanaqpacha Orquideas. Now, this was some real news! Wasting no time, I went back to the train station to update Jim and Chris and see what our next step should be in the face of a certain calamity. The hotels abutting the river, where Etzold had enquired about lodging. The Hanaqpacha Inn is the white hotel on the far right. Map and note from the hotel manager who told us about the probable evacuation of the hotels along the river, with the name and rates (and her signature) for the Hanaqpacha Orquideas hotel. Not much had changed at the station. There were angry people, dejected people, sad people, scared people, frustrated people and even some happy people (mostly the young college-agers who were making the most of this unexpected interruption in their journey). Rain was still coming down, but just a light drizzle, and lines were ebbing and flowing at the Information Center near the now-security-guarded entrance gate. Men on radios were seen everywhere, usually with serious looks on their faces. There were no trains. 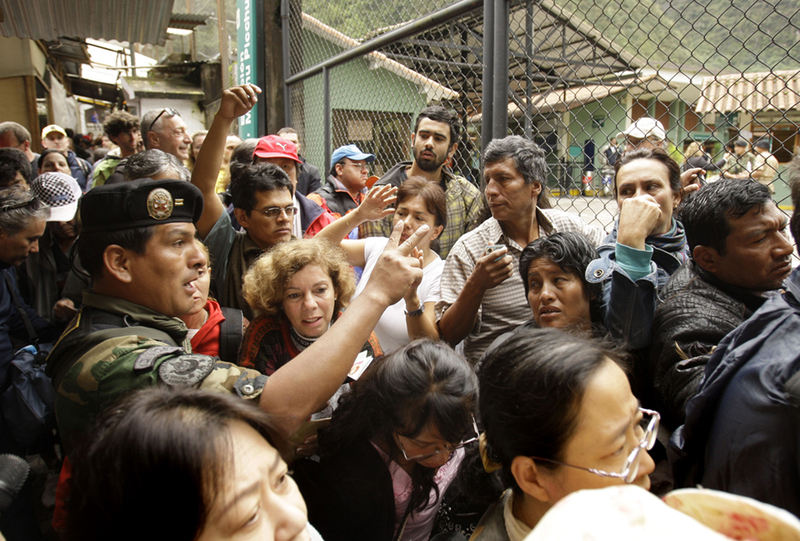 Secuirty personnel try to control the angry, frustrated crowds at the entrance and Information Center at the Aguas Calientes train station earlier in the day. The INHL Team discussed this bit of yet-unreported news which I had picked up. Of course, this was news almost directly from a pretty good source. Who in the world would NOT rent out rooms under these circumstances, unless the authorities had actually issued an evacuation warning? We took this information seriously. A decision was made to continue the backup plan and seek out a hotel uphill and away from the raging Urubamba, so out I went into the night, again, through the Vendor’s Market you must pass through to get in or out of the train station, and into the wet dark streets of Aguas Calientes. The suggested hotel, owned by the group whose property was subject to the evacuation turned out to be acceptable, the Hanaqpacha Orquideas Hotel. There was even a tour group of elderly Americans in the lobby when I walked in, which gave me comfort that this place was at least “on a list” somewhere! I paid $95 for two rooms, after first checking them out to make sure these 4th floor accommodations (no elevator) would be acceptable for our team, and headed back to the train station down a main street and past the community soccer field. That field plays a part in the later part of this story. Upon my arrival at the station, now at about 7:00pm, I see three train cars on the tracks and find out that the rail company had loaded it with passengers who had been waiting since mid-morning. This was a valiant gesture, but it hardly put a dent in the swelling masses that had now completely stripped the stock of food and drinks from the concession stand, and almost overwhelmed the restroom facilities. That was the last activity to be seen on the tracks until much later that night. Time slowly passed and Jim faced the grim possibility that his rather tricky connections back to Nashville the next day might be as dependable as the retaining walls along the Urubamba that night. Rumors that we continued to pick up didn’t help matters any, and when the promised 8:00pm announcement by PeruRail didn’t happen…and still hadn’t happened an hour later…the tension was as palpable as the roar of the river rushing nearby in the night. 9:00pm came and went, no news. Desperation has a smell and that train station was full of it. No one wanted to leave, in case some news or a train might appear. But, as the minutes ticked by, restlessness fed the desperation and it became more and more obvious that a disaster was looming. We took turns going over to the Information Center to find out the latest news, either from the officials inside or from the host of ticket holders milling around outside. Nearing 10:15pm, its my turn to go seek information, and off I plunge into the crowds. Standing in line at the window, I finally am able to speak to a clerk inside. 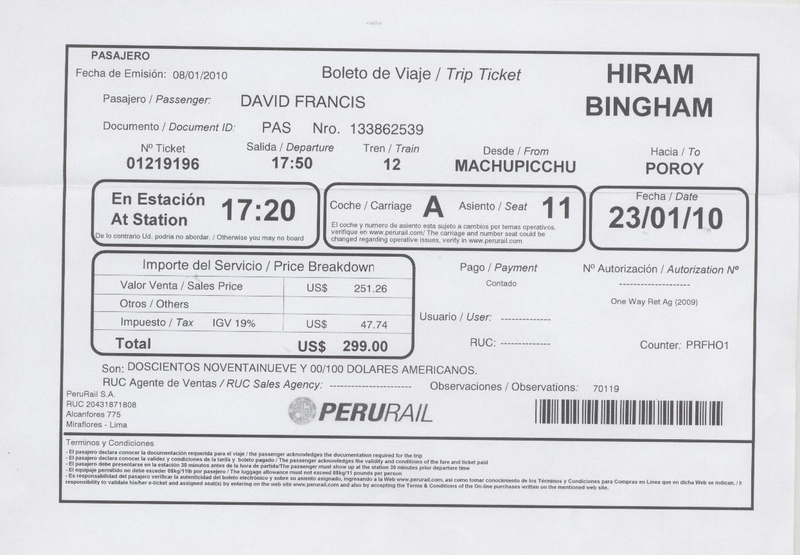 When she hears the words “Hiram Bingham” and looks at my ticket, something changed (finally). She yelled to another lady in the Information Center in Spanish and that woman motioned me around the side of the Center. There, she confirmed I held a Hiram Bingham ticket, and grabbed my arm and led me through the crowd to a line forming in an obscure side of the Train Station lobby, where other passengers had been brought by occasional officials recently. Everyone looked scared, but hopeful. I told the woman I needed to go get the rest of my party and my pack, and headed over to the front of the station and our table…it was empty! Even my pack was gone. No sign of Jim and Chris. I couldn’t believe it! Here was our first breakthrough and something has happened to them…what could it be? I turned and ran back to that line on the side of the station yelling their names frantically…then, a yell back in response, and then a sighting of them slugging through the crowd with all our gear towards that same fortunate group in the obscure line on the side of the building. We met there and traded stories. It seems that shortly after I left the table to go look for information a couple of ladies came out of the crowd by the station entrance and approached Chris and Jim with the question “David Francis?” Now that’s not my name, at least not my full name, but it is the name they put on our Hiram Bingham Train tickets, thinking that our middle names were our surnames as in most of Latin America! Chris was “Christopher Curtis” and Jim was “James Dinday”…a mixed up version of his proper middle name, Lindsay. So, they had jumped up with those words and, as best they could, explained our situation…the ladies, it turns out, had been sent by Llama Path, our outfitter, to find us and get us on the next train out…if at all possible. They told Jim and Chris to come with them to the same side of the station where I had been taken and it was there where we met…taking deep breaths and thanking providence for this break as we stood in a relatively short, nervous-looking line. It looked like a train was soon to arrive and they intended to move us onto it without taking us through the crowded station…they were worried about desperate people making irrational decisions, something we had whispered about to ourselves, as well. The last thing anyone wanted was a riot when the next (maybe the last) train showed up! As we stood there, still no train in the station, several people nearby broke or pushed through the security barriers and tried to force their way into our group or onto the platform in front of us. The railroad’s security personnel and local police effectively dealt with each thrust and kept a relative peace…though we could feel the rising tension of desperation take a significant step up. We were all waiting, watching, wondering….when will we get out of here? A light approached from the distance on the tacks, and a cheer could be heard inside the station, but the doors had been locked to the platform and security personnel were stationed in a regular cordon around the area. The sound of the locomotive engine could soon be heard and the screeching of the wheels on the rails, as the train came into the station and slowed to a halt. They were now checking our papers in the obscure line, and soon we were being shuttled in small groups around the corner of the building and along the platform onto the train. Finally, inside a car with packs off and stowed, sitting in opposing seats for four with a table between, we knew we had a chance to get out of that town. The idea of a luxury trip on the Hiram Bingham didn’t seem so important anymore. The hotel room we bought would probably go unused, at least by us! That wasn’t the end of the night’s adventure, for we still had a very dangerous passage to the town of Ollantaytambo ahead. 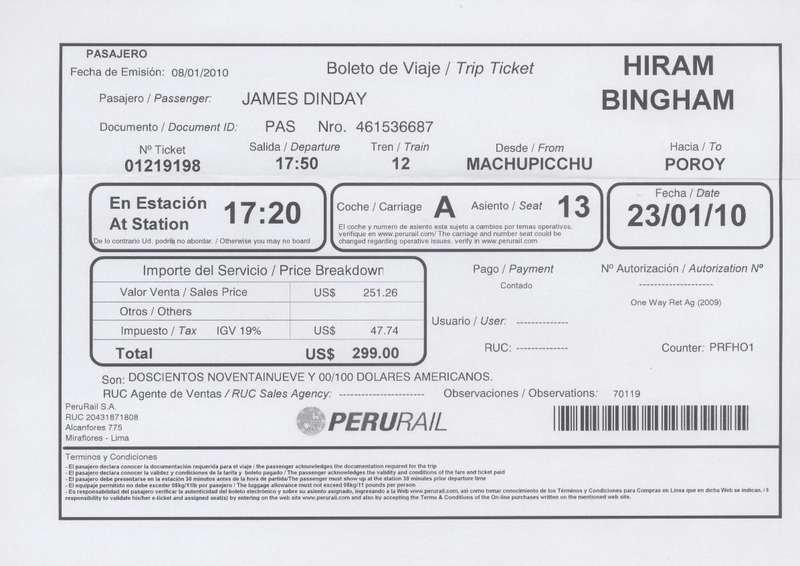 We would not be taken to Poroy Station outside of Cuzco, as the ticket originally was set up. The tracks were too dangerous and the officials wanted to get us to the first station that could connect us to a road, where we’d be transferred by bus to Cuzco. That is, if we could get there. Map showing our destination of Ollantaytambo and the other Urubamba River villages south of Aguas Calientes. 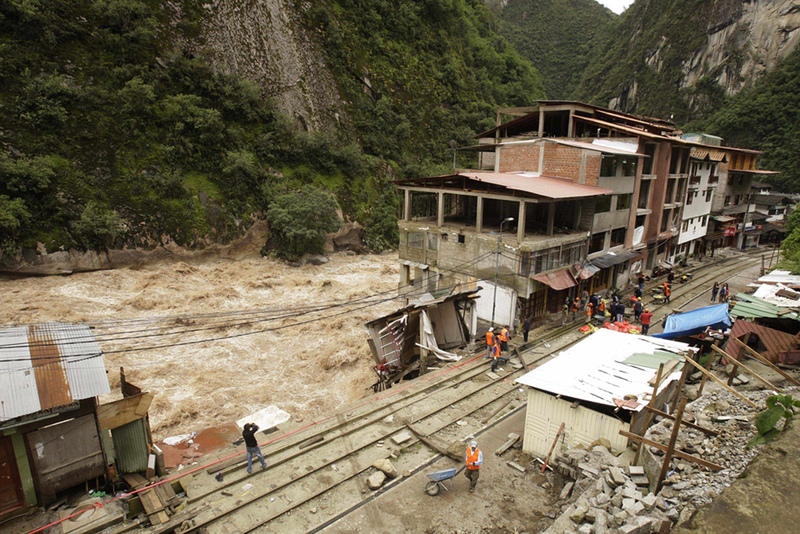 The train was moving slowly now, carefully inching along those tracks at the edge of the swollen Urubamba. Occasionally we got glimpses of work crews with headlamps and spot lights working on overpasses of side streams that were feeding into the gorged river. Once, we passed a dam and spillway lit by floodlights and we all jumped to the window…the sight was astounding: a raging torrent was overwhelming the dam and there, stuck in a spillway a giant tree looking like some cork wedged in the torrent. The sounds and sights, the jerks and bangs and swaying of the cars on this passage made an impression that will not soon be forgotten. For my part, it was as scary an experience as many I’ve been through. We were all waiting for that track to collapse and pitch our train into the swollen brown waters of the river, so each sound and odd motion sent sparks through our nervous system. After an hour and a half of this, we were all exhausted and relieved when we pulled into the Ollantaytambo rail station. There, the PeruRail personnel advised us they would off load us into buses they had hired to take us to Cuzco. As we filed in single file behind our assigned steward, a young man from Llama Path found us and let us know the company was tracking the situation and he’d help get us to the buses. This was a good sign, as the confusion and traffic jam outside that station on the muddy roads and vacant lots where fifty or more busses and vans were stacked waiting for us made for a confusing and frenetic walk to the waiting bus…and no one wanted to get on the wrong one! We were crammed into our bus with all our packs and forty other people, then away we go at break-neck speed on those tiny rain slick rural streets through the Peruvian countryside at midnight. Jim thought this was the worst part of the trip, I just kept my eyes closed and tried to catch a nap so I wouldn’t see the risky driving maneuvers! At 1:30am Sunday, we finally arrive in Cuzco and were let off at a small Plaza near the Plaza de Armas…only a few blocks from the hotel if we had to walk. But, Llama Path again had a team waiting for us! Those young men grabbed our packs and loaded us into a nice van/mini-bus and drove us the short distance to the Hotel Monasterio, where we gratefully picked up our room keys and stumbled off. The bags we had previously left with the hotel were waiting in our new rooms, and we paused to have a Cusquena beer together and toast to the successful outcome and to a disaster that had barely been averted…at least for us! Kind sleep enveloped us about 3:00am…it had been a very long, stressful, 24-hour day since arising the previous morning at 3:00am to hike the final leg of the Inca Trail to the Sun Gate and Machu Picchu! A day we will never forget. 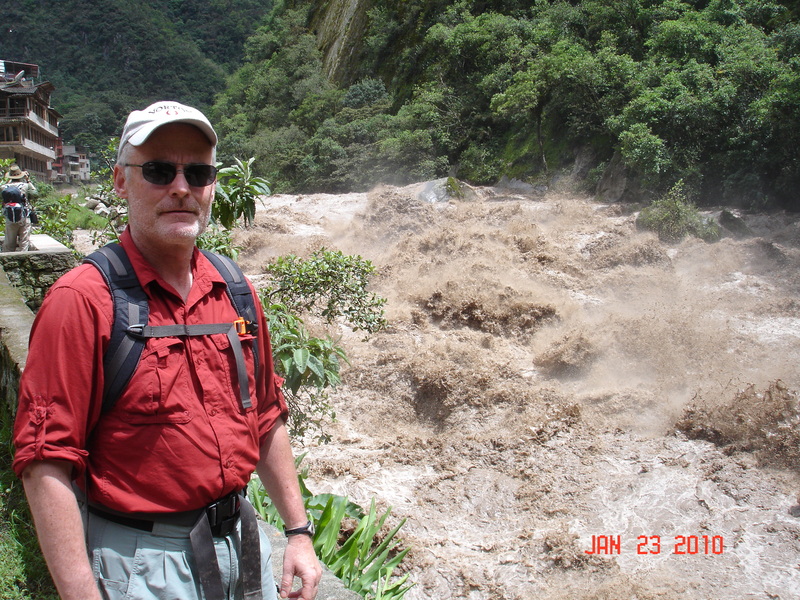 It wasn’t until Monday Jan 25th that we got confirmation that there was a real disaster back in Aguas Calientes, this from personnel at the PeruRail office in the Larco Mar Shopping Center in Lima, overlooking the South Pacific Ocean on the last day of the adventure of a lifetime! I dropped in Monday evening as Chris and I were topping off the final South American sunset, and asked the clerks what was really happening up there. The international press corps was finally picking up on the story. Helicopters were being brought in to evacuate the 2,000 or so visitors who were stranded in the town, and they were using that community soccer field I passed during the search for our “back up” hotel that Saturday night as their landing zone for the evacuations. God bless those souls we left behind, and those that never made it. 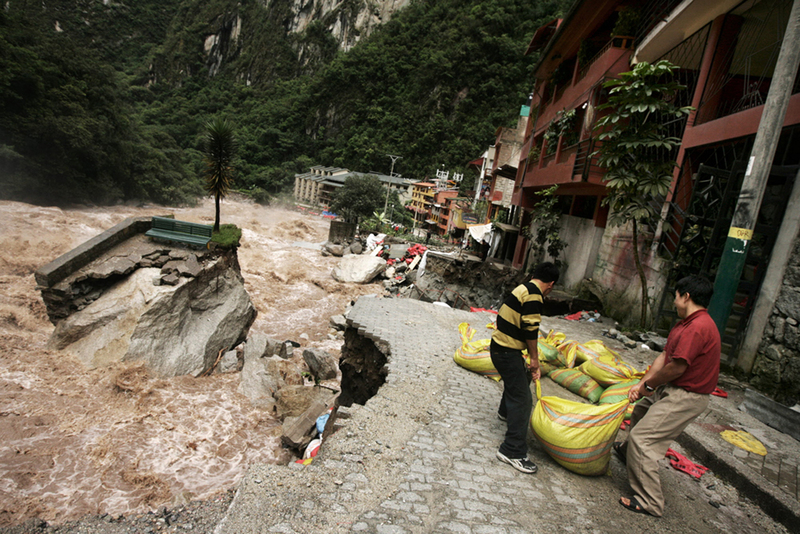 The Urubamba River takes it toll on the village of Aguas Calientes a few days after the INHL Team escapes! Shown is what is left of a section of the “river walk” along which we took photos on Saturday! The river eating away at the foundations of the hotels along the Urubamba, which Etzold had visited to enquire about emergency rooms on Saturday night! … et nunc, et semper! And, finally, a report filed by a CBS affiliate reporter from Birmingham, Alabama…she and her daughter were in the groups that started two days after our group on the Inca Trail, and found themselves mired in the cusp of the disaster and evacuation. Note, in her story, the description of the soccer field used to evacuate the thousands of stranded tourists by helicopter, it was that same soccer field that had been a point of reference for me in my exploration of the back streets uphill from the train station when we rented the rooms at the Hotel Hanaqpacha Orquidas, the rooms in Aguas Calientes we never used. ~ by Dave Etzold on January 27, 2010. Incredible. Absolutely incredible. Thank you so much for sharing Dave.